Jusden received invaluable wine-pairing/tasting techniques from appointed Master Sommeliers in Michelin Star restaurants and 5-star luxury hotels while touring Europe with Lenny Kravitz. Jusden has over 8 years of retail buying background and over 10 years of retail sales management experience. Most recently, Jusden has taken a position with Sextant Winery in Paso Robles, CA as the Marketing-DTC Director. At Sextant, Jusden will use his sales, category, and brand management experience to further enhance this growing winery. Previously, he managed and developed the Exclusive/Private Label wine portfolio and marketing strategy for Bevmo! while also managing the sake and vermouth categories for the company. Additionally, Jusden was the assistant winemaker for El Sol Winery in Livermore Valley CA for more than 4 years. This experience was supplemented with various Oenology courses at UC Davis. Jusden is a Certified Sake Professional with merit and was also on the Bevmo! Wine Tasting Panel. 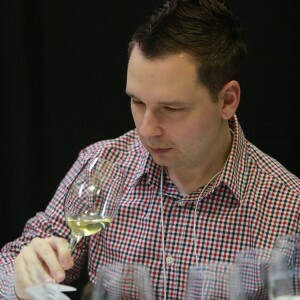 Jusden is a professional wine judge and has participated in such competitions as the SF Chronicle Wine Competition, Press Democrat North Coast Wine Challenge as well as the Sonoma County Harvest Fair Wine Competition. Jusden resides on the Central Coast, CA with his wife, 4 year old daughter and 5 month old daughter. In his free time he collects/plays vintage drums from the 1920’s, enjoys rock climbing, and contemplates when to open bottles from his large Bordeaux wine collection.